The AutoMow Spider ILD02 slope mower is highly innovative, with award-winning patented engineering and versatile use. REMOTE OPERATED. EXTREME SLOPE. SAFE OPERATION. Highly specialized for the mowing of slopes and hard-to-mow areas, AutoMow all-terrain slope mowers are patented and innovative radio remote control mowers. A unique piece of equipment, they’re designed for the maintenance of almost all types of terrain. Slope mowers are versatile machines capable of mowing fine turf as well as heavy brush, from flat areas to slopes up to 55 degrees. The operation is safe, comfortable and productive. AutoMow’s slope mowers were specially designed for the hardest to reach and hardest to maintain areas. Areas that once required multiple crews, equipment trailers, time, and money are mowed in a fraction of the time. Safety is a top priority. Through its inherently safe design, AutoMow nearly eliminates operator safety risks commonly associated with ground maintenance. Avoid exposure to toxic fumes, slips and falls on hillsides, speeding traffic, rocks, and reptiles with the touch of AutoMow’s remote control. Mow where no traditional mower has gone before with AutoMow’s all-terrain remote operated mowers by Spider. Significantly cut time and resources spent mowing hard to reach areas while increasing operator safety with remote control operation from over 100 yards away. AutoMow effortlessly maintains areas of heavy vegetation, such as roadsides, municipal grounds, solar farms, and other high danger or hard-to-mow spots in minutes, not days. 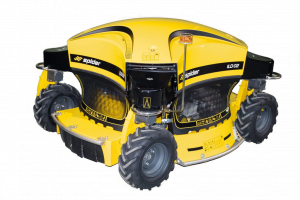 Spider’s family of remote control, all terrain mowers were built with the commercial lawn maintenance industry in mind. AutoMow is the innovative, safe solution trusted by a growing number of commercial lawn maintenance crews, municipalities, fire departments and departments of transportation nationwide. Easily and efficiently mow challenging areas with a single machine while increasing the safety of your crew and reducing the risk and liability of harmful accidents before they happen. AutoMow’s ability to operate via a wireless remote control allows for safe, productive, and comfortable operation. Effortlessly cut through all types of terrain and slopes up to 55°. Overgrown vegetation and rough terrains are no match for AutoMow. Mow up to 4x faster with less equipment and less manpower, even in areas only previously accessible by weedwackers. AutoMow greatly reduces operator safety risks while shearing through dangerous areas like highway medians and interstates.